Thank you for using a PENTAX istDS2 digital camera. 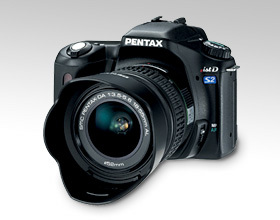 PENTAX wishes to announce the release of Firmware Update Software Version 1.02 for istDS2. Support for SDHC Memory cards. Only istDS2 users are permitted to download the firmware update. Copy right RICOH IMAGING COMPANY, LTD. If you are copying the firmware update file to the SD card by connecting the camera directly to your computer. If you are copying the firmware update file to the SD card using a memory card reader / writer. *We recommend using the AC adapter (K-AC10) for update firmware. For download the StuffIt Expander, please visit the URL below. readme.txt:	The text file that explained update procedure in details. fwdc149b.bin: This is the updated firmware. After formatting the SD card, copy the fwdc149b.bin file to the route directory of the SD card. Please read the readme.txt file attached to the firmware update before updating the firmware. Download of Microsoft WindowsMe/2000/XP Version software is here. Download of Mac OS Version software is here. PENTAX is a trademark of RICOH IMAGING COMPANY, LTD.
All other brands or product names trademarks or registered trademarks of their respective companies.